There was a time when making fresh pasta from scratch was horrifying. I wouldn’t even consider giving it a try, especially after watching Dad, who’s a seasoned cook, waste some 18 eggs, struggling to get it right. This year for Father’s Day, I did something a bit selfish and booked a pasta-making class. I couldn’t think of anything I’d rather do to celebrate how much Dad means to me than spending some quality time, cooking with him. Dad and I have become a pasta-making dynamic duo. Making the pasta is fun, yes, yes, of course. Kneading the dough can be exhausting, so it’s good to work together and take turns. We make pasta together every chance we get and everyone loves to get involved. Now that I know the secret, I can’t wait to share it with you, because once you’ve tasted fresh pasta that you’ve made with your own two hands, you will never, ever reach for a box of the stuff at the market. Making pasta at home may sound crazy, but, it is fundamentally simple peasant food. Villagers are smart people, using whatever staples they always have on hand, like eggs, flour, salt. Form the dough, cook it in salted water, serve it with whatever the garden has to offer. There, you go. The trick to great pasta lies in the recipe, but it’s not really the measurements that count. In fact, the measurements are somewhat arbitrary. Technique is more important. 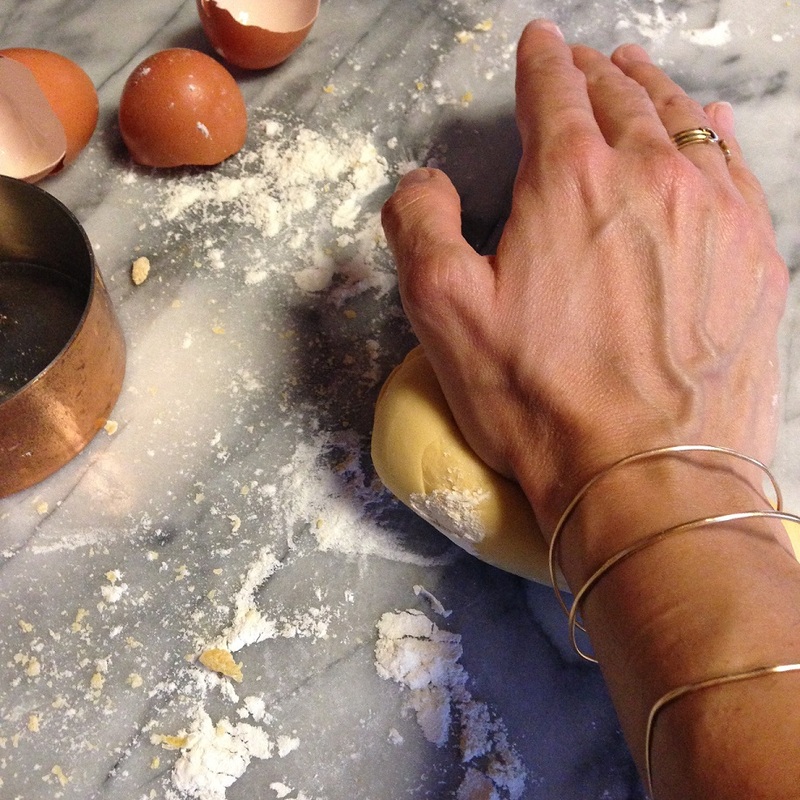 You have to know what to look for – a smooth ball of dough that you can squeeze like a stress ball. It’s surprisingly easy and just so much fun. There really isn’t anything you can do wrong with making fresh pasta. Just combine eggs with enough flour, massaging the dough against until it no longer feels sticky. The texture is smooth, no more lines or creases. Making pasta is such a hippy experience. You just go with it. How much flour you will need depends on the day, season, the humidity. On a hot and dry summer night, you may use less flour than you would on a rainy autumn evening. Look up recipes and you’ll see so many variations in the amount of flour, number of eggs, whether/not water should be incorporated. Give mine a try. It never fails me. Read through the instructions once or twice so you get the idea and just go with it. Have fun! While young women fantasize about becoming globe-trotting elegant supermodels, old girls like me daydream about living life like an Italian nonna in a Tuscan village. Then what happens is that I convince myself I can do crafty things, like make clothing for my Daisy and make fresh pasta for dinner. Things like sewing and pasta machines start popping up on a wishlist I send to my husband. No one really don’t needs a pasta machine. Nonna would have rolled out the dough by hand and cut it with a knife. I wanted one, so Shawn got it for me. After a few early disappointing attempts at using it, it got banished to the deep, dark corners of the pantry, never to see the light of day again (along with my sewing machine). Now that I know how easy it is to make fresh pasta by hand, the old Atlas is my favorite. It’s under $100 and easy to find online. It comes in a variety of beautiful colors. You could get three in the colors of the Italian flag and have pasta-making parties at home. There is a motorized attachment for the KitchenAid stand mixer, but it’s noisy. There is one for the Atlas, but I wouldn’t suggest getting it, because you really don’t need it. The old hand-crank works great. Kids love cranking the pasta through the rollers. My little Daisy says it’s so much and we all love getting together to make dinner. If your kitchen is anything like mine, it’s cluttered enough. You don’t need any new fancy kitchen gadgets, not even one of those wooden antenna-looking thingies that to hold the strands of dough. Just grab a couple of clean clothes hangers. Seriously. That was Dad’s idea and worked great! Cooking pasta is also a very simple process, but is quite often misunderstood. There are a few basic tips that everyone needs to know. Fill a pot with more water than you think you need for the amount of pasta. Be generous with the salt. I don’t know where you get your pasta water, but mine doesn’t come seasoned. Don’t be afraid to add a heap of salt. Drizzling olive oil into the pasta water is really not necessary and will just make your sauce slide right off your noodles. Bring the water to a proper rolling boil. No one likes mushy pasta. Don’t overcook the pasta. Pick up a strand or two for testing. Remove the pasta just before it’s fully coo ked. The Italians call this stage al dente meaning to the tooth. The pasta will continue to cook in the sauce after you remove it from the water. Don’t toss all the pasta water away. Save a little bit, because it’s starchy and will help your sauce stick to the pasta better. This weekend, take a little bit of time to make pasta at home. You’ll be surprised at all the little helping hands that will show up. Whatever you do, make this and taste it. You will never want the boxed stuff again. Then serve it with any of your favorite sauces. We did a fresh checca made with tomatoes, basil and parsley from our garden, a teeny bit of garlic and lots of fruity olive oil. We warmed the noodles with the tomatoes and herbs before serving them as an unexpected side to grilled ribeye. I secretly wished I could have eaten all the pasta by myself with a bit of salt and olive oil. Does that make me a bad person? Dear Colette, if your post does not convince the rest of the world to run into the kitchen straight away and get busy with pasta making, then I do not know what will!!! I was looking at your Fresh Pasta making with Mom on our way to Valencia in the bus. Good call! I’ll get right to it. Have fun wherever you are. Laloo both. Machigs.